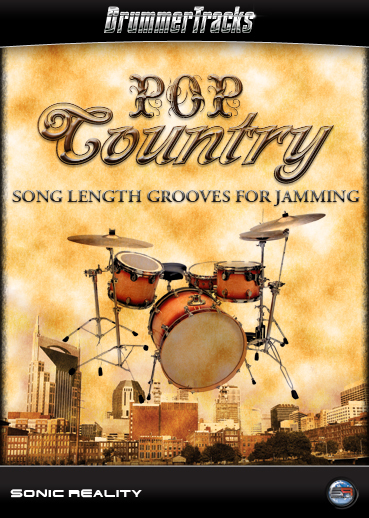 Straight from the heart of Nashville, Pop Country DrummerTracks delivers the feel and sound of today's hot country hits! Recorded in world class studios with top-of-the-line gear, these Pop Country Grooves were played by top Nashville session musicians and include percussion. Sonic Reality, makers of high end software drum instruments have put together something brand new and EASY for any musician who wants to jam along with expert played realistic drum tracks. Introducing “Drummer Tracks” a series of “song length drum grooves” complete with live played variations, fills or other elements not normally found in short drum loops. Whether you need inspiration for writing a song or just want to jam and practice, Drummer Tracks feel like you’re playing along with a top drummer live in a studio wherever you are! Play the tracks in your computer or on your iPhone™, iPod™, mp3 player, DAW or media player and then pick up your guitar, bass or any other instrument and JAM along! Each Drummer Track title is like an album of songs except they are JUST drum tracks without the music! You play along with your instrument and experience a different kind of LIVE real drum performance to jam to complete with true human tempo fluctuation, dynamics, variations, fills and a wide variety of different styles of playing. Drummer Tracks are recorded in top studios around the world and are played by professional drummers who have worked with artists such as Prince, P Diddy, Lauryn Hill, Sting, Peter Gabriel, Genesis, Steely Dan, Chick Corea, Pat Metheny Group, Timbaland, Justin Timberlake, Tears for Fears, Herbie Hancock, 10,000 Maniacs, Blues Brothers and many more. Each album has drums both recorded and played in the authentic style of the title’s theme for the ultimate virtual reality jamming experience!